Caption slip reads: "Photographer: McCarty. Reporter: Ostler. Assignment: Arson. 25/26: Mrs. Mina M. LeBleu grandmother of Don Henry McElroy, 14 step son of Winford G. Johnson, suspect. 27/28: Winford G. Johnson, 39 suspect (tallest) and Sgt. E.B. 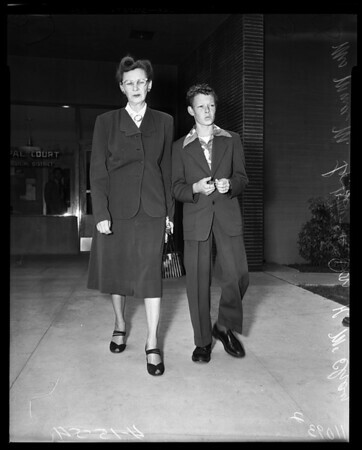 Hatcher, Sheriff Arson detail, L.A. Johnson (on left in front of court and right in street".